Use these painting supplies on your next home project. 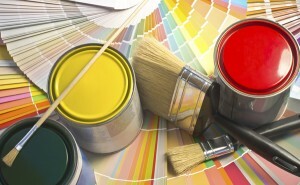 Do you have a home painting project in the near future? If you do, have you gotten all of your painting supplies together? Preparation is key when it comes to painting because the more you are prepared, the easier your project will be to complete. For some reason there are a few great painting supplies are commonly underused. Try to remember these items for your next painting project. Safety should always be a concern when it comes to any home improvement project. When it comes to painting there are a few precautionary measures that should be taken. One in particular that people always seem to forget is painting masks. These are especially important when you are using a paint sprayer so you don’t have to breathe in those nasty fumes. For whatever reason, people frequently seem to neglect to use painters tape. It is pretty inexpensive but serves a huge purpose. Sometimes it can be difficult to paint around certain areas. For example, maybe you want to keep your window sills white, but paint the walls blue. One of the best ways of doing this is to tape them up with painters tape. It will make your painting project a whole lot easier. You simply cannot have enough drop cloths. First off, they cost next to nothing. You can buy a package of them for just a few dollars. Secondly, they are incredibly important for keeping paint off your furniture, carpet, and floors. Before you start painting a room, make sure everything is covered well with drop cloths. If you are really concerned that paint is going seep through, throw a couple layers of drop cloths down. It is always better to be safe than sorry when it comes to protecting things from the paint. People seem to forget that they have another option besides paint roller and brushes. Paint sprayers can be an extremely useful tool if you are trying to cover a large area. For example, if you have high ceilings in your home you may want to opt for a paint sprayer. They are not too difficult to use and typically leave great results.